Looking for exceptional energy performance and sound control for a new home or remodeling project? Look no further than the powerful combination of fiberglass insulation and air sealing. 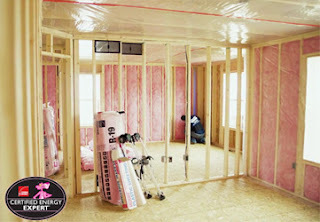 The combination of air sealing and properly installed fiberglass insulation provides superb energy performance. This combination provides exceptional energy efficiency at a lower price point than spray foam insulation. This combination can also be used for sound control. Areas such as bathrooms emit noise from plumbing and ventilation. Sealing and insulating the bathroom perimeter can reduce noise bleed. This small investment can make a big difference! Click here to learn more about the power of fiberglass insulation and air sealing from our President, Renee Wilson, and our Operations Manager, Brian Auman. If you’re interested in discussing your residential insulation project, give us a call! If your home was built prior to or during the 1960s, it’s a tossup if it has insulation in exterior walls. Even if your home is from this era and does have exterior wall insulation, it’s hard to say how much is there. Do your summer plans include home remodeling or replacing siding? It’s a great time to upgrade exterior wall insulation! 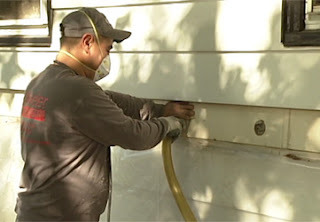 After existing siding is removed, small access points are drilled into the wall exterior through which loose-fill fiberglass or cellulose is dense packed into the cavity. If you are not remodeling or replacing siding, do not worry! By carefully removing a piece of siding midway up the wall we can access the exterior of the wall cavity and follow the same procedure. Learn more about insulating sidewalls by clicking on this video where our Operations Manager, Brian Auman, will walk you through this process. If you’re interested in adding sidewall insulation to your existing home, give us a call!